I love clothes. I love to dress up. I love to shop. I don't leave the house without wearing a scarf, shirt or in the winter a jacket but being a big dog , I sometimes have problems finding fashions for me . I know other big girls and guys have the same problem. I am often asked where I get my clothes. 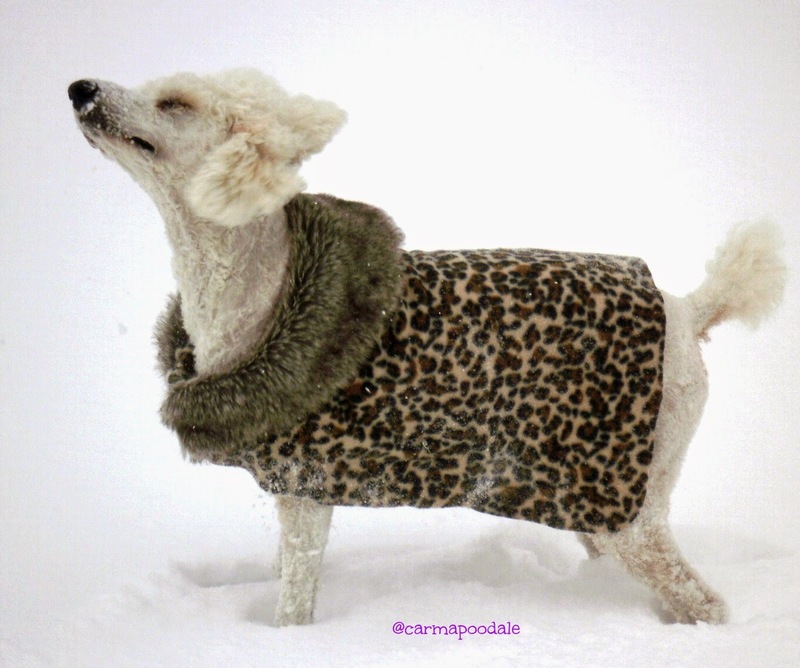 I see a lot of clothing that I would love to wear but are always made for the smaller dog but never made for standard poodles , like me. Big Dogs CAN look cute in clothes just like smaller dogs!!! Thanks to my friends Kim from Keep The Tail Wagging and Christie from Life with Beagle for discussing with me about ideas of what I want to talk about on this blog and encouraging me to go for it. I will be starting a new series on my blog that I hope you will enjoy. One Friday's a month I will be discussing fashions for dogs especially those who are hard to fit aka big dogs. I will be sharing my tips on where to buy clothing, some sewing projects even my ma could do so I know your mom can do them too and how to dress a large or extra large dog. The coat I am wearing in the photo above was made by ma. Don't worry, I will include tips for the small and medium dog and maybe even cat fashions too. I will also be adding fashion tips about things I love like nail polish. I always have my nails painted purple. I hope you come back on Friday to see what I have to talk about. I hope you enjoy the segments. If you have any questions or suggestions please feel free to contact me. I hope that it's a interest to some followers. Molly Mew our kitty said she would pawticipate every once in a while. Hopefully she will make kitties want to be fashionistas too. What a fun post Carma! Too bad Kilo doesn't care too much for clothes. Maybe Kilo would like a nice bandanna? Those can be very fashionable too for dogs who don't like to wear clothes. I love the idea. I know you guys get a lot of winter weather and its important to keep warm. So, being warm and fashionable for dogs would be such a good idea. Great idea - can't wait to read your fashion tips! You go Carma! How fun! Maya has just one dress and a coat I bought her last year. The coat doesn't fit so I've been meaning to adjust it. Pierson doesn't have any clothes but I have made him wear the Pawz booties in the snow so that he didn't get ice balls between his toes.